If you want healthy, not-so-fattening fast food in South Africa, this is probably the closest you're going to get. 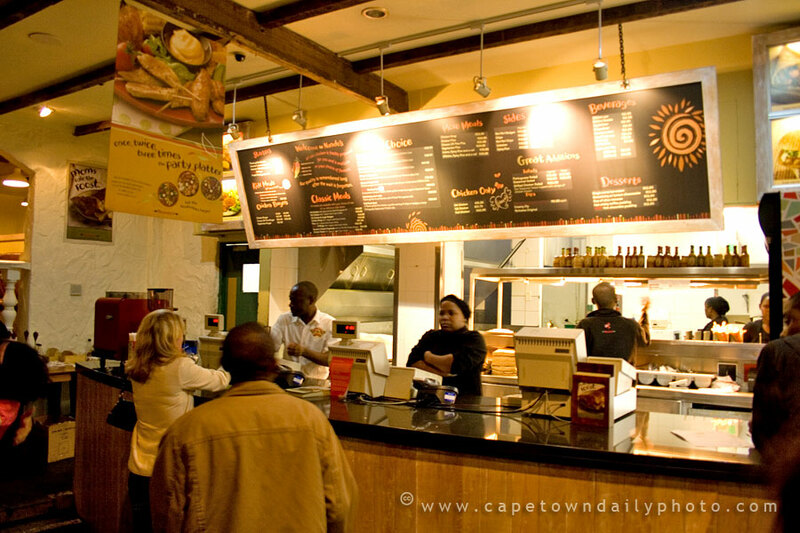 We don't buy take-aways very often at all, but if we must, then Nando's is usually a good choice (this is the take-away counter at Nando's in Kloof Street). They sell chicken, but unlike another (very popular) chain, their chicken is not covered in a thick layer of oily batter and then deep-fried; instead it's basted with either peri-peri or lemon & herb sauce, and then flame-grilled. Nando's have become famous for their off-the-wall advertising over the years; and their in-store signage is pretty clever too, usually combining some sort of poultry theme with whatever's currently in the news. Posted in General on Tuesday, 13 May, 2008 by Kerry-Anne.